Belleville's 300 TROP ST was designed with the comfort of a running shoe but with the ruggedness of a full size combat boot. 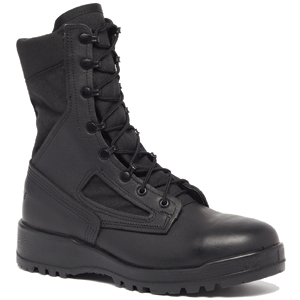 It features an upper constructed from 100% pure cowhide suede and abrasion-resistant ballistic nylon for toughness. This boot was designed for hot weather so the upper is unlined and highly breathable. A lightweight steel toe won't weigh you down and is featured for protection from falling hazards. For top traction in both solid and loose surfaces, the Belleville 300 features a VIBRAM Sierra with large lug design. The VANGUARD sole system provides running shoe comfort for long duty shifts and extended wear. This boot is proudly made in the USA and Berry Compliant. I ordered a full size less than my Nike running shoes and they fit perfect. I got 3 years out of my Bates boots so I hope these Bellevilles are just as good. Heard good things about these boots in particular from a cop friend that uses them for work. I just wanted a good solid boot that will last. There are so many made in china cheap boots on the market that you have to be be careful. I bought these for my son who is starting at the Naval Academy prep school. The recruiter recommended this specific model which wasnt too expensive. So far my son says theyre good and runs in them no problem. These 300 Trop boots are lighter than most of the steel toe boots ive worn in the past. I work in a shipping warehouse around forklifts and pallets so toe protection is a must. I like these boots so far. Much easier on my heels because my feel ache much less at the end of the day. I see them lasting a while.